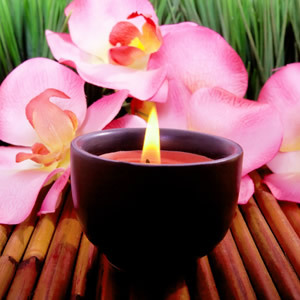 Feng Shui practitioners associate each part of the body with a particular color. If you're suffering from a nagging ache or pain, check this list to find which colors can bring relief. You can draw on the healing power of color through your diet, dress and decor. The more you focus on a therapeutic color, the easier it will be to enjoy optimal health. Still, absorbing black dispels anxiety. Use this color if you're suffering from insomnia, high blood pressure or stomach pain. Black can also ease inflammations, and can be used to good effect if you have a burn, rash or infection. Feng Shui practitioners associate the ears with black, so any problem with your ears or hearing can be treated with this color. A powerful combination of invigorating red and soothing blue/purple can restore equilibrium to your body. It is a good color to draw upon if you suffer from epilepsy or chemical imbalances. Feng Shui links the skeletal system with this color, so if you're suffering from hip dysplasia, back pain or scoliosis, you can benefit from purple. Blue is the color of release. Integrate generous splashes of this color into your life if you want to release a grudge or need to get something off your chest. This color also has the power to refresh your body after extended periods of work, and it is perfect for people who are hyperactive. In Feng Shui circles, blue is associated with the thyroid gland. Whether you have an overactive or sluggish thyroid, blue can bring balance to this part of your body. A stimulating combination of refreshing blue and clarifying yellow/green promotes growth. It, therefore, should not be used if you're a cancer patient -- when you want to inhibit cell growth. Green should be used if you have anemia, low sperm count or broken bones, because it speeds healing with health problems that require increased cell production. Feng Shui links the feet with this color, so you can also benefit from green if you have athlete's foot, plantar warts, bunions, corns or calluses. Cheerful yellow adds light and clarity wherever it is used. People who suffer from Alzheimer's disease can benefit greatly from this color, as can anyone who is coping with learning disabilities. Yellow can also be very helpful if you suffer from depression. Feng Shui practitioners associate overall health with this color, so if you have a compromised immune system or another serious disease that affects every part of your body, yellow can be an enormous benefit. A warming blend of radiant red and clarifying yellow, orange has transformative power. It is therefore an excellent aid to the digestion, as it helps convert food to energy in the most efficient way possible. Draw on the power of orange if you suffer from colitis, irritable bowel syndrome, nausea or food allergies. Feng Shui links this color to the large intestine, bladder and pelvis, so if you have health issues related to these areas, orange can help you, too. Fortifying red infuses the body with energy. Its healing power can alleviate head colds, sinusitis and muscular disorders by causing tissues to shrink. People who suffer from heart disease and chronic headaches can also benefit from this color, as red increases blood flow. Many Feng Shui practitioners have drawn a correlation between the eyes and this color, so if you are having problems with conjunctivitis, glaucoma or poor eyesight, integrate more red into your surroundings. Like a crystal prism, white diffuses color. It is associated with purity. Because white inhibits growth, it's an excellent color to use if you suffer from cancer. White can also be helpful if you are warding off a bacterial or viral infection. Pure white can be hard on the eyes, so if you want to draw on the healing power of this color without suffering from its glaring effect, add a few drops of brown or red to the mix. Feng Shui associates white with the mouth and respiratory system, so if you have problems in these areas, try integrating more of this color into your surroundings.